FULTON – The Fulton City School District’s quarterly Universal Pre-Kindergarten Family Night attracted several families for some hands-on science fun. Granby Elementary School Universal Pre-Kindergarten student Edison Smith, left, plays at the ‘clean mud’ station with his brother, third grader Oliver Smith, right, during the recent UPK Family Science Night, held at the Fulton Junior High School. 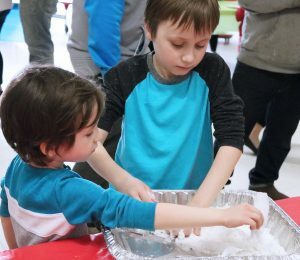 Held in the Fulton Junior High School cafeteria, the science-themed night featured experiments from each of the UPK programs, held for Lanigan, Fairgrieve, Volney and Granby elementary schools. Heather Witter, FCSD Director of Literacy and UPK, said the event was to offer exploratory learning. Stations included: clean mud, with grated soap, toilet paper and water; Orbeez for sensory needs; bubble blowing; a Skittles and Sprite station which had shown color separation, as well as shaving cream rain cloud, where the shaving cream represented clouds and once that became saturated with colored water it replicated rain. Snacks and free books were also offered. Witter said the activities offered just a glimpse of what the UPK students will learn all year. Scientific thinking is one of many components to the New York State Pre-Kindergarten Foundation for the Common Core. Throughout the 2018-19 school year, FCSD UPK students should learn how to ask questions and make predictions based on observations/manipulations of things and events in the environment; test predictions through exploration and experimentation and generate explanations and communicate conclusions.